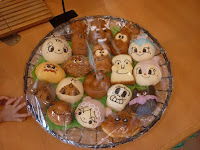 We went to Anpanman Museum in Yokohama. It was quite disappointing because the attraction is for younger children and Aratakara were a bit bored. 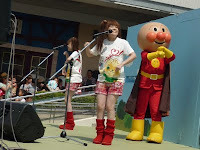 On top of that, only Anpanman appeared on the show, which was performed outside in such a hot weather, but still, the place was packed by loads of families. 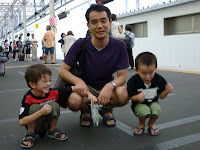 Aratakara were anyway happy to see their Uncle Hiro after a year. Takara even wanted Uncle Hiro to come back to my parents together.